This reel is pre-wound with a # 18 twisted nylon line. Easy to see gold colour. 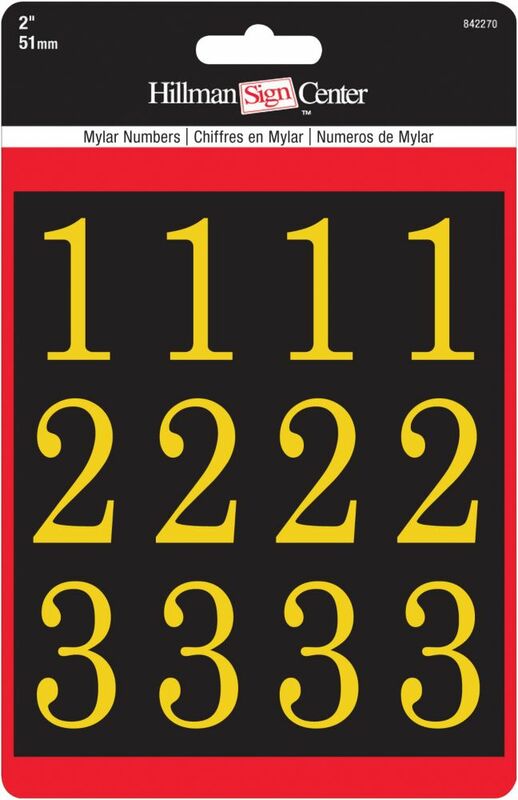 2 Inch Gold & Black Packaged Numbers is rated 2.1 out of 5 by 10. Rated 1 out of 5 by Dave from Believe these reviews!!! I realize you can't always believe the reviews on some products. But these are 100% correct. Even cleaning the surface these numbers are applied to with 91% alcohol, in about 24 hrs, the corners of these numbers start to curl up to come off. Definitely better adhesive is needed. Rated 3 out of 5 by ObjectiveReviewer from These mailbox stickers are okay. I recently cleaned and repainted my mailbox and used these numbe... These mailbox stickers are okay. I recently cleaned and repainted my mailbox and used these numbers on each side. I was hoping for a high end look with highly reflective gold numbers. These numbers are not clearly visible unless they are in direct sunlight. In the shade or on a cloudy day, you have to get pretty close to clearly make out the numbers. They were very easy to apply to the freshly painted metal mailbox (after the paint was fully dry). I There were some rough spots on the side of my mailbox where I had to apply these stickers to. I found that if I wasn't careful when smoothing the stickers, I would end up scratching the black off where the surface was rough and the gold underneath would show. I applied these stickers about three weeks ago, and so far they have held up and not begun to peel off. Only time will tell how long they last on the mailbox. Hopefully they will last for years until I need to repaint the mailbox again. Rated 1 out of 5 by Jose from The adhesive stopped working after 2 weeks.... The adhesive stopped working after 2 weeks. Rated 1 out of 5 by ehartman from Horrible I bought these to install on 6 brand new mailboxes for rentals. A month later, they ALL are peeling. They looked like they are nice quality, and look good at first on black mailboxes...but DO NOT BUY. Just go with the standard white reflective ones. So disappointed. Not to mention I now have to go and redo them all. Rated 2 out of 5 by James from Poor Visibility These numbers are priced right and they are fairly easy to apply to a clean surface . The problem with these numbers is visibility. Unless the sun is shining directly on them, they are almost invisible. Without the sunlight on them you have to get within a few feet to even see them . I will be replacing them with reflective ones.